When tasked with selecting the right equipment to handle your packaging process there are three main areas to take into consideration. First, what style of package is right for the product? Second, what characteristics does the product have? Finally, what performance criteria is required of this particular process? This Technology Zone offers an insight into the latest innovations in packaging and bagging system design. Flexicon have introduced a TIP-TITE® drum tipper that is designed for use with poorly-flowing or agglomerated materials, allowing rapid transfer of free- and non-free-flowing bulk solid materials dust-free. The HAVER & BOECKER Machinery Division will be exhibiting at this year’s POWTECH on April 9 – 11 under the motto “Perfect Flow for our blue planet”. The focus is on the question of sustainability and resource conservation. The packaging specialist from Oelde is presenting itself together with HAVER & BOECKER Wire Weaving, and BEHN + BATES – the experts for food packaging (Hall 1, Stand 535). BEUMER Group will exhibit its expertise as a system provider for complete high-capacity packaging lines at POWTECH 2019 in Nuremberg from April 9 – 11, hall 1, booth 627. BEUMER Group optimizes the performance of each machine, its components and the high-level controls to ensure high throughput of the lines for (petro)chemical products and building materials. BECKUM – At bauma, which will take place in Munich from 8 to 14 April, BEUMER Group will provide information on their efficient transport solutions for the mining industry, among other areas. Overland conveyors and Pipe Conveyors transport various raw materials over long distances and often through rough terrain. This is generally faster, more cost-efficient and environmentally friendly than trucking. The system supplier also offers comprehensive technology for the cement and building materials industries and is the only supplier to provide complete packaging lines from a single source – from filling and palletising to transport packaging of the pallet. Traditionally multiple ‘in-line’ FIBC filling machines have been used for high-speed packing of bulk materials. However, this process can encounter challenges that impedes on performance and the process itself. When carrying out multiple functions at a single bag filling station, the throughput of these machines are limited. A new BULK-OUT® Bulk Bag Discharger from Flexicon features stainless steel open-channel construction for applications in which contamination of the product or equipment cannot be tolerated. 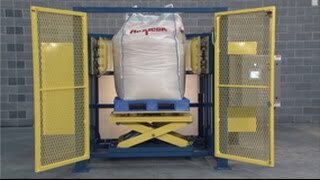 STERLING, IL – Sterling Systems & Controls, Inc. is pleased to announce the availability of its line of bulk bag handling systems. These include customized unloading systems and also customized bulk bag filling systems. LUDWIGSHAFEN/RHEIN – For many producers whose goods are destined for sale, there is not always a clear solution when it comes to finding the right packaging for their products. Even if big bags are the most commonly used method of transportation and storage, with their filling capacity of 1,000 to 1,500 liters, they are not always suitable for every customer. As part of the wider Rotolok Group, Solitec design and manufacture a wide range of modular and flexible bulk bag dischargers for the chemical, food and pharmaceutical industries.